From the airport a shuttle bus will drive you to the railway station St-Charles (8,50€). From there, a taxi can lead you directly to your cruise terminal. Be aware that the different cruise terminals of Marseille are pretty far apart, check with your cruise company which dock will be used. By train: from the railway station St-Charles you can join easily your cruise terminal by taxi. For GPS users: Place de la Joliette, Marseille. 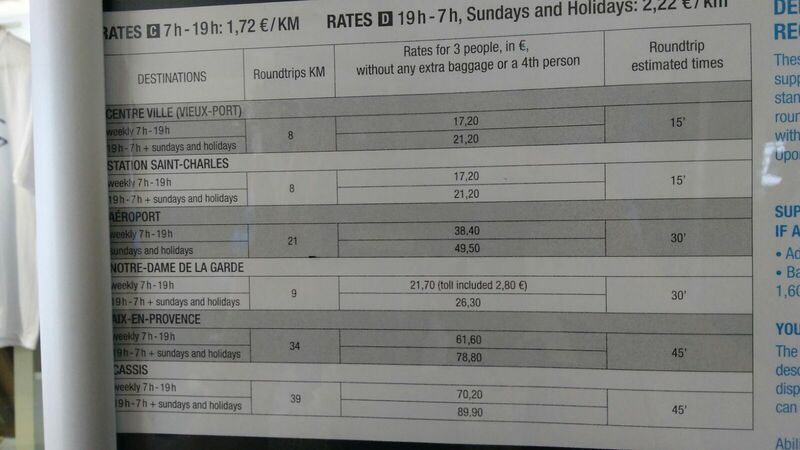 A taxi will cost about 17 Euro to the old port. The Vieux (old) Port is the hub of Marseilles, lined by its quays, filled with fishing boats and yachts, and surrounded by small streets teeming with seafood restaurants , cafés and shops. The Quai des Belges, at the end of the port, hosts a fish market, every morning of the week. The Vieux Port is the center of touristic Marseille. It is the main marina of the city and it is a good starting point for walks around the old city, along the shopping street "Canebiere" or to the church Notre Dame de la Garde. South of La Canebière, bohemian cours Julien (known as the ‘cours Ju') sits on the site of the former central food market. These days it is the city's most youthful area, home to a varied collection of fashion boutiques, bookshops, terrace cafés and music venues. North of the Vieux Port is the hilly district of Le Panier, the oldest part of the city and traditionally the first stop for immigrants – and tourists. It's hard to resist its narrow streets, steep stairways and ancient, pastel-colored houses. There is also a regular, smaller ferry that potters from one side of the Vieux Port to the other. Tourist information: 4 La Canebière and at the train station Gare St-Charles. The Abbaye de St-Victor (3 rue de l'Abbaye, 04 96 11 22 60), a fascinating double-decker church and once one of the most powerful abbeys in the South, is worth the climb. Another (steep) climb, via twisting streets and steps, will take you to the city's most famous landmark: Notre-Dame de la Garde, rue Fort du Sanctuaire, an extraordinary neo-Byzantine extravagance of a basilica. There is no need to to take a cruise organized expensive shuttle into town. Train 1 - Notre-Dame de la Garde via Vieux Port and Abbaye de St-Victor - 50 min trip; Jan-Nov, from 10h; every 30 min during the summer. Train 2- Vieux Marseille, via Cathedrale, La Vieille Charite, Quartier du Panier - 40 min trip; Easter-Oct, from 10h15; every hour during the summer. From 12h-14h the trains only run if there are at least 10 passengers. 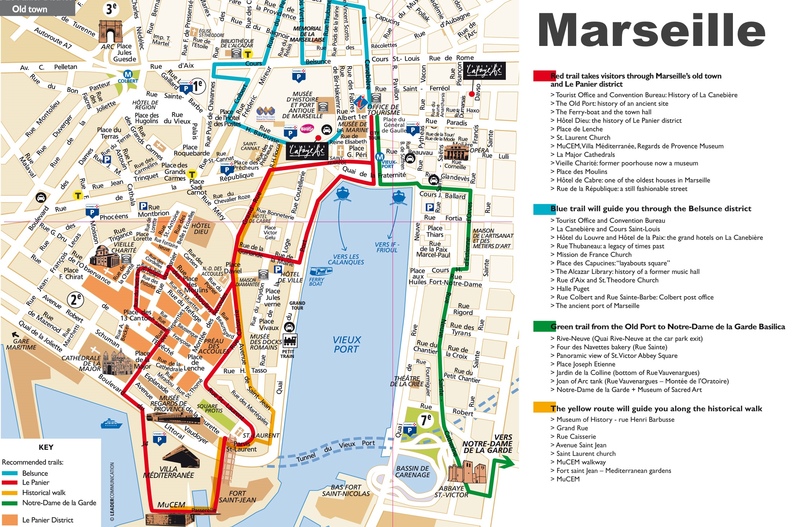 You can also opt for the hop on/off services of Marseille Le Grand Tour which also starts at the same spot. Taxis are also offering tours. Aix-en-Provence: Take the shuttle bus to Old Port, walk or ride Métro to train station, then take a train to Aix-en-Provence (45 minutes, twice an hour, 9 Euro one way), Arles (1.5 hours), or Avignon (1 hour). Bus 50 also takes you from the train station to Aix-en-Provence, a 35 minute ride, approx. 6 Euro one way. Every 5 minutes or so. Tickets can be bought on the bus. Map of Aix-en-Provence. The sun-bleached white turrets of Château d'If, the 16th-century island prison immortalized in Alexandre Dumas' The Count of Monte Cristo, are nowadays populated by seagulls and salamanders rather than convicts. Ferries take about 20 minutes and leave every hour from the Vieux Port's quai de Belges – now officially re-named quai de la Fraternité. The city's cuisine includes many typical dishes, the best known of which is bouillabaisse, a fish stew.